The agent of unhappy Inter Milan striker Adriano says he has no doubt the Brazil forward will play again. 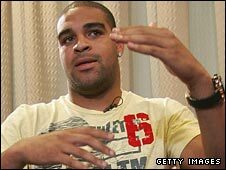 Last week Adriano, 27, said he would take a break from playing football to "rethink his career". But his agent, Gilmar Rinaldi, said on Tuesday: "In my view he will not quit football. We need to evaluate the situation, the player and the man. "First of all, Adriano is calm and well. Last week was good for him. He just needs two months to find himself." Adriano's agent flew to Italy on Tuesday to reassure Inter about the player's future. Adriano did not return to Italy after Brazil's World Cup qualifiers against Ecuadro and Peru, in which he was an unused substitute. He said: "I've lost the happiness of playing. I wouldn't like to go back to Italy, I want to live in peace here in Brazil. "I don't know if I'm going to stay for one, two or three months without playing." There has been speculation Adriano might leave Inter and sign with either his former club Flamengo in Brazil or Turkish club Fenerbahce. But Rinaldi insisted the player was more likely to remain with the Nerazzurri. "The rumours about offers from Turkey and Brazil are not true," he added. "Adriano still has 14 months left on his Inter contract and he might stay. We will talk about it with the club." Inter coach Jose Mourinho was philosophical about his player's future. "Inter have done everything to help Adriano before I arrived and with me, as a coach and human being, so have the president and his team-mates," he said. "We'll see. The important thing is that he's happy. If he's happy like this, if you lose the player but the man is happy, perfect. "But for the moment I don't want to talk because I haven't spoken to him yet. Two people with a positive relationship will definitely have the chance to speak and understand the real reasons for his words." Adriano, whose contract with Inter runs until June 2010, also denied media reports of possible illness or addiction problems. Asked whether he could play with a Brazilian club, Adriano said the only possibility would be Flamengo.